Dr. Tillman is certified through Invisalign® to straighten teeth without metal brackets and wires. 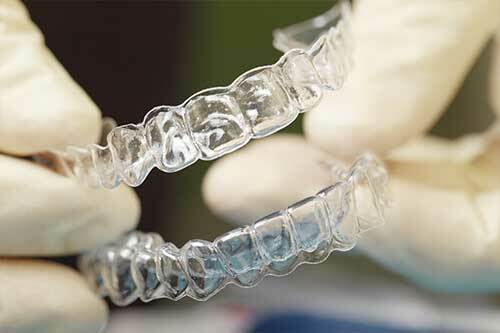 The process occurs with a series of clear aligning trays, in as little as 6 months. If you would like to improve the appearance of your smile, clear braces are a discreet orthodontic treatment option. Unlike metal brackets and wires commonly used for traditional braces, custom trays are created to slightly alter the position of teeth gradually over time. Made of smooth lightweight plastic materials, they are easily removable so you can enjoy a meal, brush teeth and floss. Not only are trays custom made to produce a straighter smile, they are also fitted and made to be more comfortable than their traditional counterparts. As you continue to straighten your smile you should switch trays about every two weeks. Each tray is slightly different to promote the process and continue to encourage movement till eventually your smile is properly aligned. We work with you to provide cost-efficient oral healthcare to give equal opportunity for all patients to receive treatments that will dramatically improve their smile. We work with your insurance company to evaluate and deduct what we can from the initial cost to make the treatment as affordable for you as possible. This will vary from patient to patient depending to the types of dental plans provided.